Jeff (Tim Williams, left) inspects a chart while Fran (Nicole Korbisch, right) converses with Lionel (Paul Brissett) in Imagined Theatre’s Facility. Photo courtesy of Imagined Theatre. 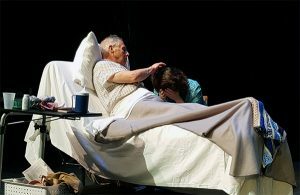 One of the most striking dramas in the 2017 Minnesota Fringe Festival is Imagined Theatre’s Facility, a play about elder care and dementia – two highly charged subjects that are often theatre taboos. 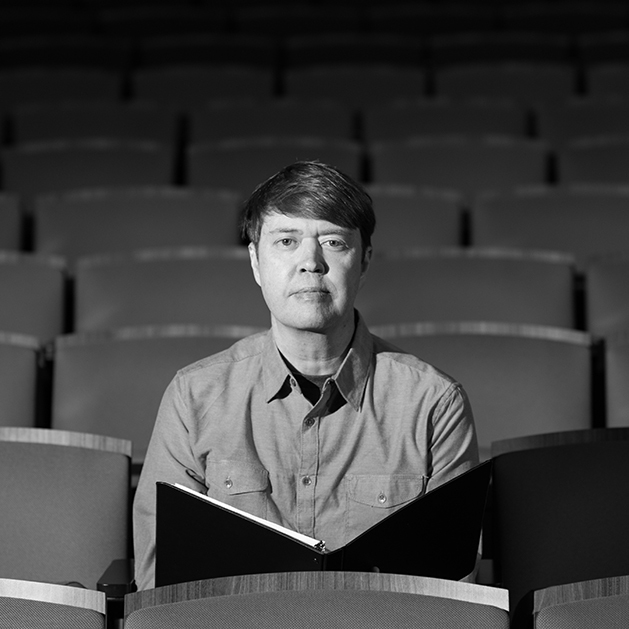 The Arts Reader‘s Basil Considine spoke with Facility playwright and director Phil Darg about creating this piece. What inspired you to write a play about Alzheimer’s and elder care? The situations and characters presented in Facility are largely based on real-life experiences and actual events – some of which are my own. Other aspects I have read about in news reports, or have heard about from those who have gone through this experience. 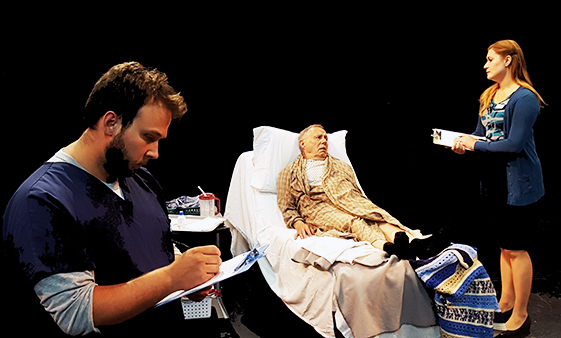 Note that the word “Alzheimer’s” never appears in the play – since there are forms of senior dementia which are non-Alzheimer’s, the precise nature of the main character’s medical condition (beyond having “dementia”) is intentionally left unspecified. Tangled emotions reach a height (and a low) in Facility. Photo courtesy of Imagined Theatre. Does the play have a central conceit or message that you are trying to convey? The piece intends to convey the issues involved in institutional care for senior dementia patients, some of its frustrating and heartbreaking aspects, the system that treats this condition, and how this situation can affect family members and their relationships. The main purpose is not to villify individual roles or persons, but rather to depict some of the issues likely to be present in at least some of these cases. I expected that the show might generate some controversy. I do not view that as being problematic, however, since such controversy can lead to discussion about these issues. I have personally witnessed both excellent care and less-than-acceptable medical care. However, Facility highlights a less-than-acceptable level of care as a means of highlighting this issue. Most of the feedback that I have received so far confirms many of the aspects presented in the show, and I believe that these are issues that need to be examined more closely. The plot of this story doesn’t have a clear resolution or a neat, tied-up ending. How did you arrive at this ending? Without giving away too much about the course of the show, let me just say that the ending is one that is common for these types of situations. However, the events that will transpire after the “ending” are not completely certain, since it is not entirely clear what actions some of the characters will – or will not – be taking next. I think of the plot of this piece as being a series of revelations, meaning that it isn’t so much “what happens” as it is that the entire situation is slowly revealed to the audience. Once these revelations are complete, there is little else to dramatize, and we understand – or, rather, speculate on – the events that will likely occur after the play’s end. How does this play fit within the larger compass of your work? 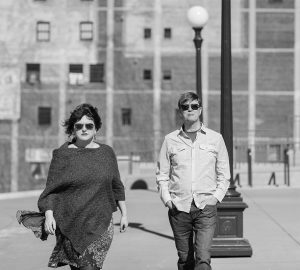 Spouses and writing partners Julie Ana Rayne (left) and Phil Darg (right) have co-written several musicals and plays. Photo courtesy of Imagined Theatre. There are a number of other new works still to be released which push boundaries in other ways, but Facility definitely represents a [personal] shift towards serious, modern drama. 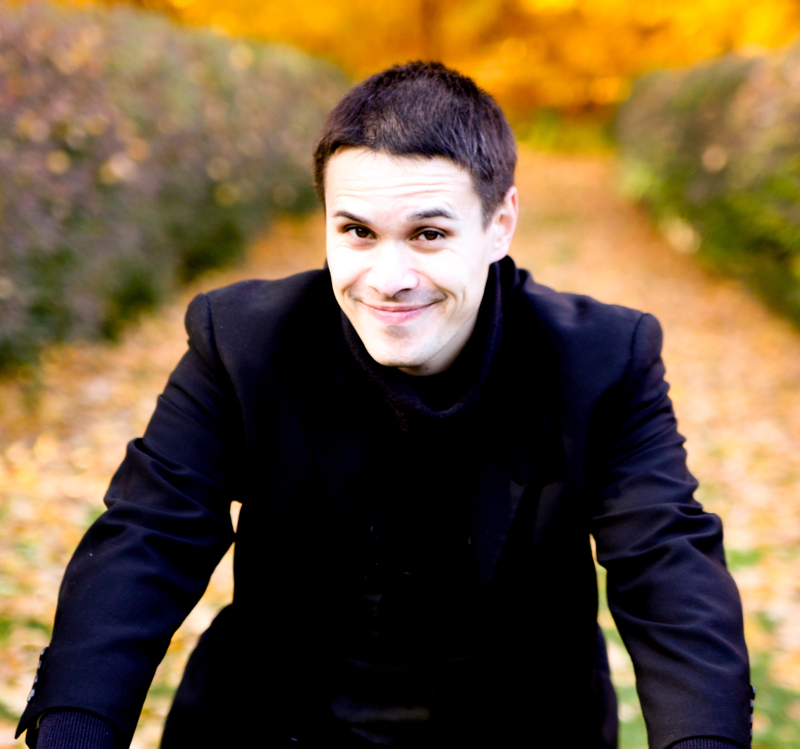 What’s up next for you as a writer? What projects or scripts are in the works? Future projects include: new short works and one-acts intended for production by other theatres around the country, at least one new full-length play, and two upcoming full-length musicals as part of the Darg & Rayne musical team. We are also looking at the possibility of hosting a new event in Minneapolis intended to showcase the new works of local writers (stay tuned).